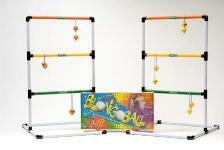 BlongoBall Game Includes: 2 BlonGoals (Racks), and 2 Sets of BlongoBalls, Yellow and Orange. This is enough for 2 players or 2 Teams. 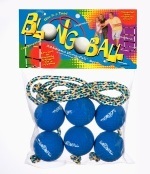 For additional players, order more BlongoBall Accessory Packs. One pack per player or team. Order one set of BlongoBalls for each additional player or team. Up to 10 Players can Play! Yellow and Orange come with the game. Three BlongoBalls per set.